Montevideo is the beautiful capital of Uruguay. This city is the commercial, administrative and cultural center of the entire Latin American country. Montevideo is located in the estuary of Rio de la Plata, as its shores are bathed by the waters of the Atlantic Ocean. The city is located only 120 km from Buenos Aires, but Montevideo is the largest city in the country, while it is the biggest and most important seaport. More than half the population of Uruguay dwelt in Montevideo - in the city, the number of inhabitants is about a million and a half. Indeed, Montevideo is the only city in the country, which has a population of over one million. Researches show that in 2007, Montevideo offered the best conditions and quality of life among all Latin American cities. Itself the capital of Uruguay is located right in the middle of the south coast. The natural harbor of the city depends on the perfectly formed bay. 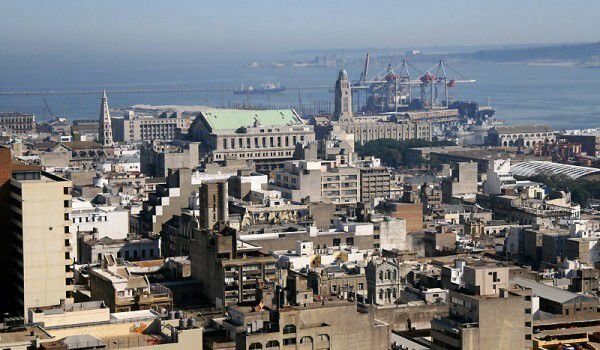 Along one of the best governed cities in South America, Montevideo ranks among the 30 most secure cities in the world. The airport of Montevideo is located about 15 km east of downtown. The history of Montevideo shows an organized settlement that began relatively late. Despite the strategic location of the local land the city was created only in 1726 and was so mainly in order to protect the lands east of the Portuguese incursions. Only a few years after its founding Montevvideo already became the most important city in the region. The rapid pace of development of the city soon began to show serious competition in Buenos Aires for the maritime trade. In different periods of the history fleets of Montevideo and Buenos Aires they consistently managed to resist the attacks of the marine armies of more than half of the European nations. With great power, however, in the early 19th century Montevideo was marked by British influence, under which remains dominated until the early 20th century. This was associated with the circumvention of commercial influence of the territories of Argentina and Brazil. When you walk around Montevideo you will find so many historical and architectural masterpieces throughout the coastal city. The old town was named Ciudad Vieja and is filled with beautiful buildings that date from the early 19th and 20th century. We must not forget that Montevideo was for centuries the center of much writers, artists and musicians. Montevideo occurred around 1800 and in the old part of the capital you will see architectural styles ranging from neoclassicism to postmodernism. Today, among the narrow streets, are antique shops and boutiques of some of the young designers of Uruguay. The famous historic, Plaza Independencia Square is situated on one of the biggest attractions of Montevideo. It is an intriguing building, called the Palacio Salvo. Interesting is that the high building was completed in 1928 and the top is a lighthouse which is visible only from the port of the city. The whole building is nearly 100 meters high, and has 27 floors. For quite a long time this "castle" in Montevideo was the highest building in the whole of Latin America. Skyscraper, Torre Antel is now the highest building in Montevideo, and in all Uruguay. Its height reaches an impressive 157.6 meters. Do not miss a walk on the coastal boulevard known as the Rambla. It covers a significant 22 km along the beach promenade in and is a popular meeting place for a drink, cycling, fishing, jogging, etc..